Lentils are small legumes, also known as "pulses," that are high in fiber and protein and low in fat. Common varieties of lentil include black, brown, green and red. Lentils are typically sold in dried form and are hard like little pebbles before the cooking process begins. You don't have to soak lentils like some other pulses, but you still have to prepare them properly to get them tender and ready to eat. Lay a kitchen towel down on your counter and spread the lentils out in a single layer. 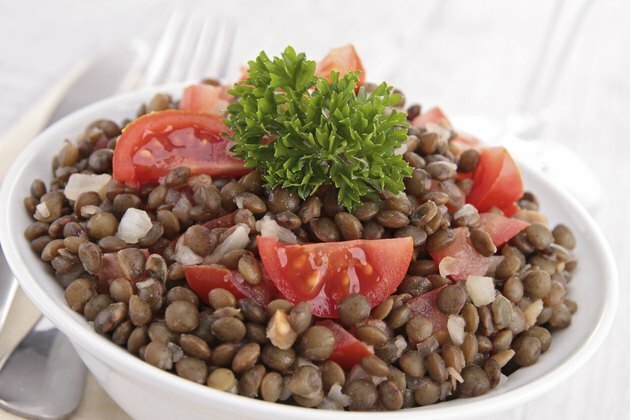 Look through the group of lentils and discard any that appear damaged or unappetizing. Empty the lentils into a strainer and run them under cold water for a couple of minutes. Add the lentils to a pot with water or broth, in a ratio of 1 ½ cups of liquid for every 1 cup of lentils. Bring the water to a boil over high heat and let it boil for 2 to 3 minutes, then reduce the heat and simmer the lentils for 45 minutes. Test the lentils for the desired tenderness -- about 10 minutes before the end of the cooking time -- by biting into one to ensure they don't get mushy. Leave the lentils in the pot to boil longer if you are using them in a puree. Lentils will double or triple in size when cooked, so ensure you have a big enough pot. Cook red lentil for just 25 minutes. Use canned lentils and just heat them through if you can't wait for the cooking time. Don’t add salt till the end of the cooking process, or the lentils may become tough.